I produced a relief map out of a ASTER Satellite Picture by using a colour ramp (Symbology -> band rendering). I want to make a map out of that in the Print Composer but the Legend is very confusing with all that values. I'd like to have a legend which shows values like 0-100 m = darkgreen, 101-200 m = green, ..., 1200-1300 = dark red. Browse other questions tagged qgis raster print-composer legend aster or ask your own question. How to get information about only one data point? Using continuous color band for raster legend in QGIS composer legend? Can I get rid of the borders around the colour boxes in QGIS Print Composer Legends? Adding labels with symbols to legend in ArcMap? 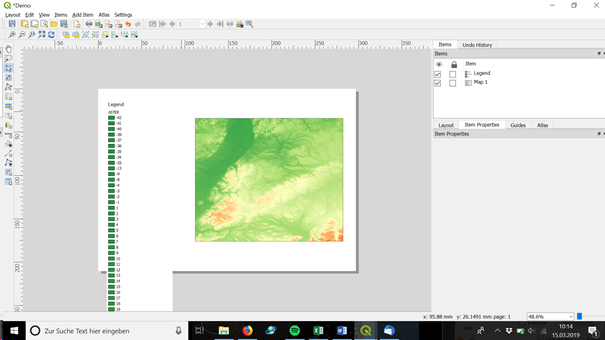 How to improve the displaying of a multiband raster in QGIS?